Qmmp (Qt Multi Media Player) is an free open-source audio player for Linux, FreeBSD and Windows. 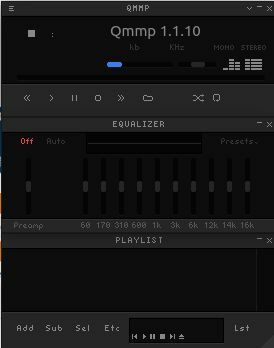 It is Winamp inspired music player. It supports all Winamp 2.x skins also. Qmmp audio player supports MP3, Ogg, Flac, Musepack, WavePack, mod, s3m, it, xm, AAC, CD Audio, WMA, Midi, SID and more. It comes with plugin support to provide DSP effects, visualization effects, 10-band equalizer, lyrics and cover art fetch, multiple playlists, Last.fm/Libre.fm scrobbler and audio formats conveter support. Open your terminal app in ubuntu and add Qmmp PPA by running the below command in terminal. Type your Ubuntu password. Then press the enter key. This will add the QMMP Music player PPA on your system. Then run the below command. After that type the below command and press enter key to install Qmmp audio player on Ubuntu. Type Y and press the enter key to confirm the installation. After the successful installation of Qmmp audio player restart your ubuntu. Click the Dash home from unity launcher. And type Qmmp in the search field. Then click Qmmp to open it.